Because it was raining this morning, I started to code up my Ozotic/Chemistry colour guide and realised that I still had so many colors that I had to swatch and post. Then I got side tracked doing house work *yay* until all of a sudden the sun came out. Its meant to rain all this week, so I dropped what I was doing and starting doing my nails instead. 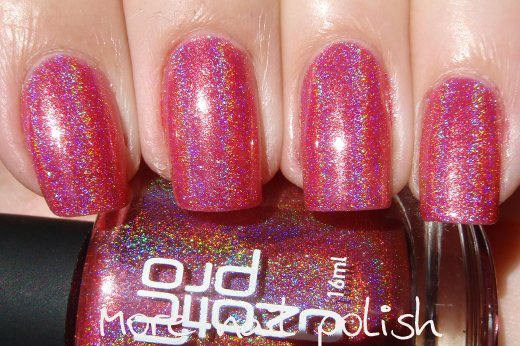 First on was Ozotic 511, which is a hot pink, small particle linear holo. I have previously posted a swatch of my Artform 511, but as that bottle is half empty I bought an Ozotic version. I had to make sure they were identical, and yes they are. Sorry, no witty chit chat tonight, in fact no dull chit chat either. Holo spam is all you get. Ooooh!!! Let the drooling commence! ooooh drooling commencing! love it! 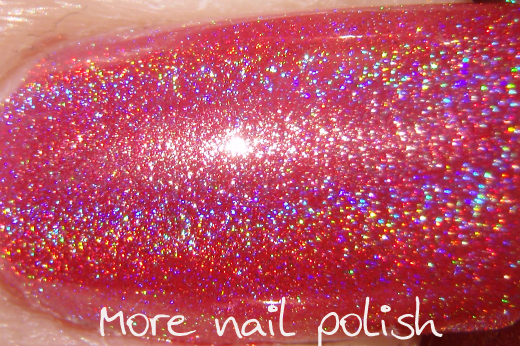 Great photos... really shows off the awesome-ness of this polish! Gorgeous holo! :)Where did you buy Ozotic polishes? 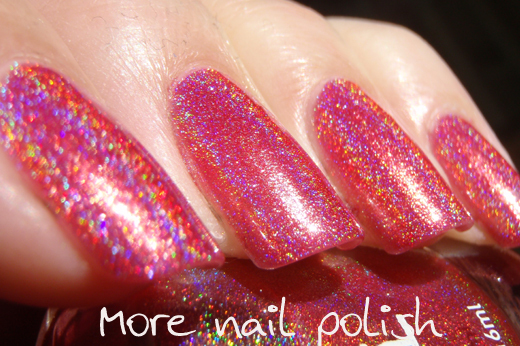 This is really cute, even though usually i'm not a big fan of red holos and glitters! Beautiful Nails, check my new ozotic pro colour guide in the top left corner, I detail where you can buy on that page.